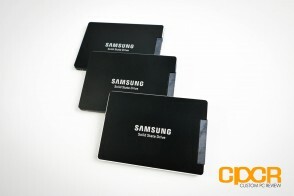 Even as a SSD reviewer, I was quite stunned when I recently attended the Samsung SSD Global Summit when they showed off a vast selection of enterprise SSDs, most of which I hadn’t even heard of, yet would probably do well in the retail market. 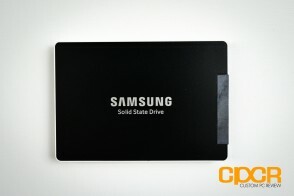 Of course, I’m sure Samsung thought the same thing as earlier this year, Samsung took a big leap forward into the retail enterprise SSD space by introducing their first ever enterprise SSD designed for the channel, the Samsung 845DC EVO. 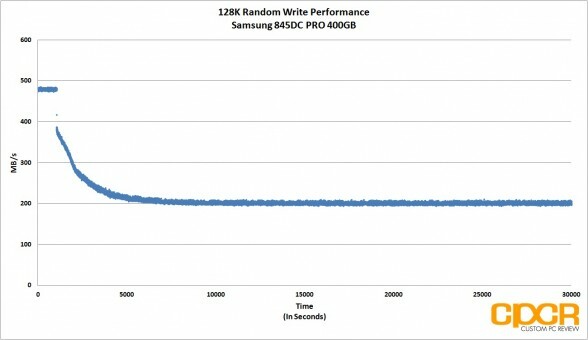 While the Samsung 845DC EVO was a fantastic enterprise SSD for read centric type of workloads, being that it’s based off Samsung’s 19nm 3-bit MLC NAND, it wasn’t ideal for those interested in using the SSD for write-intensive applications. 3-bit MLC is not only significantly slower, but also significantly lower endurance than MLC, which meant it wasn’t really competitive against most competitor’s MLC based offerings. 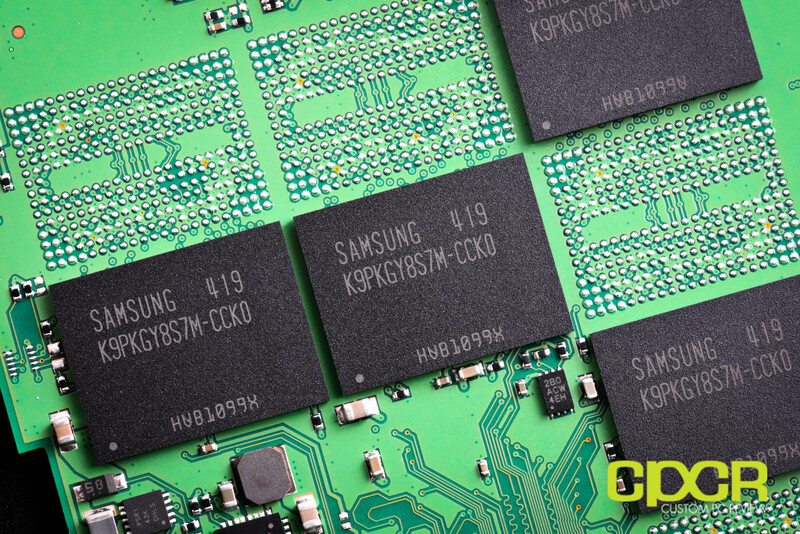 In order to fill the gap, Samsung recently introduced the Samsung 845DC PRO, which would rely on Samsung’s latest innovation, 3D V-NAND, to produce a drive that was both high performance in write intensive workloads and also high endurance as well. The Samsung 845DC PRO will come in only two capacities – 400GB and 800GB, and both capacities will only be available in the 2.5″, 7mm form factor. Today we have the opportunity to review the Samsung 845DC PRO 400GB model. According to the specs the 800GB model should perform slightly better, although not by much. Internal hardware for the Samsung 845DC PRO will include a combination of the tried and true Samsung MDX controller along with some of Samsung’s 1st generation 24-layer 3D V-NAND. 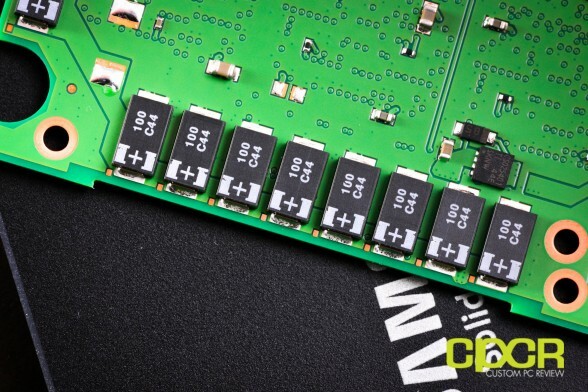 Since the Samsung 845DC PRO is an enterprise part, we also get onboard tantalum capacitors for full path power loss protection. We’ll go more in detail on the internals when we take a closer look at the drive. Warranty on the Samsung 845DC PRO is 5 years at 10DWPD (Drive Writes Per Day) across the board. This means the 400GB drive is rated at a whopping 7,300 TBW (Tera Bytes Written) while the 800GB drive is rated at 14,600 TBW. 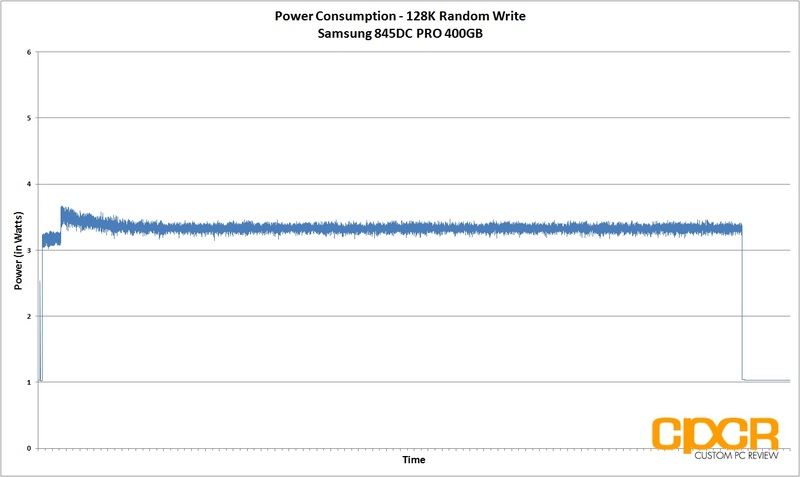 Compare that to the mere 600TBW on the 960GB Samsung 845DC EVO. This puts the Samsung 845DC PRO in a very premium category of enterprise SATA SSDs designed for write intensive workloads. Let’s take a closer look at the Samsung 845DC PRO. 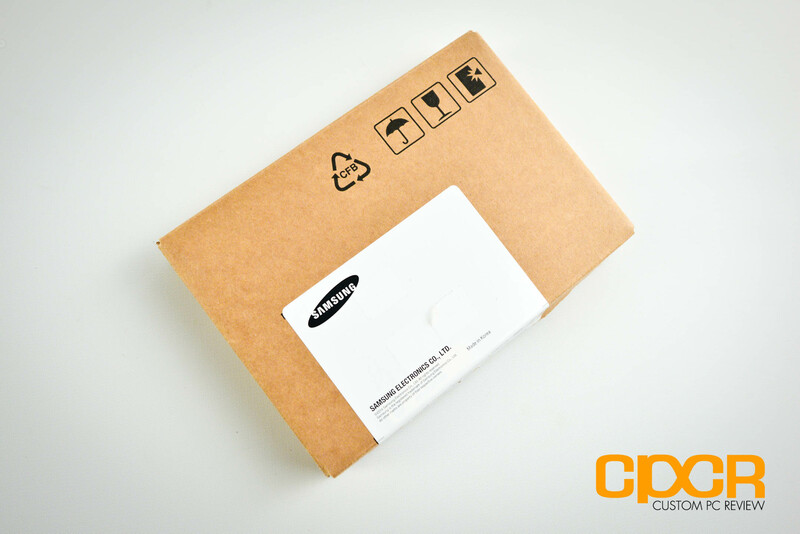 Here’s a look at the packaging for the Samsung 845DC PRO. Inside we get the Samsung 845DC PRO. Aside from a sticker change, the Samsung 845DC PRO uses the same 2.5″, 7mm thin casing as the Samsung 845DC EVO we reviewed recently. 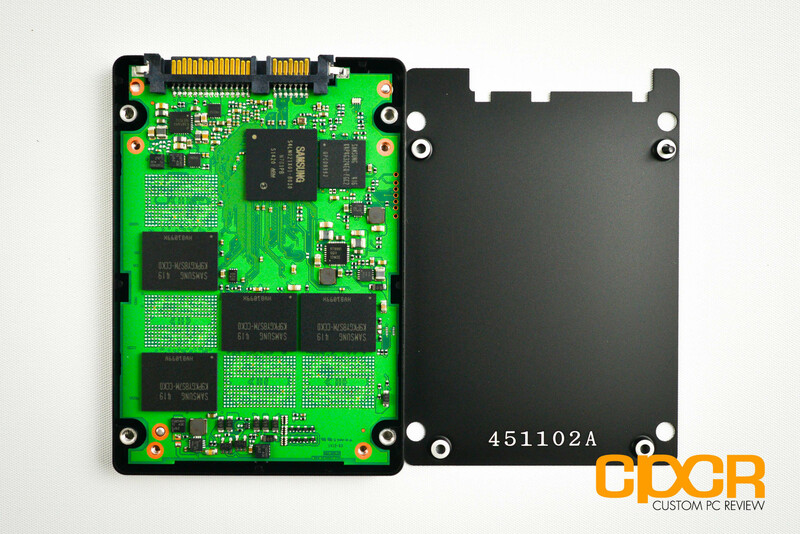 Inside the casing, we get a full sized PCB for the 400GB model. There’s clearly additional space lined up for an additional four NAND modules for the 800GB version. 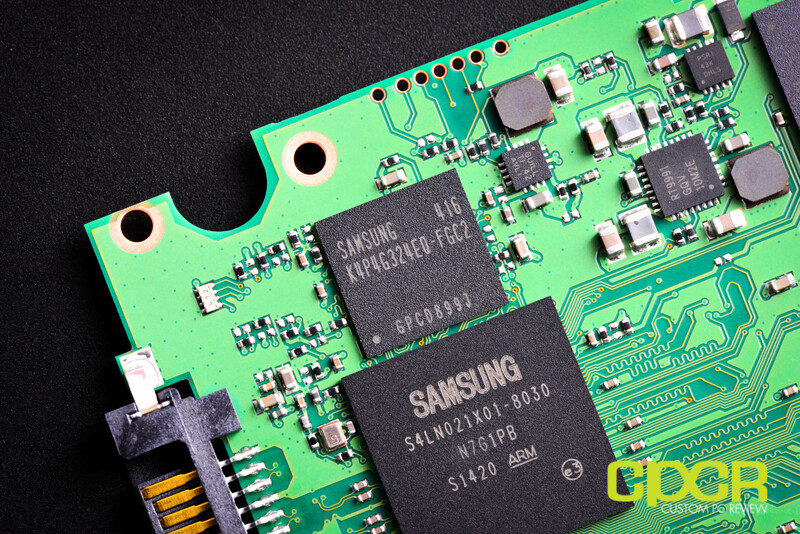 It’s interesting that Samsung is only using one side of the PCB for NAND, controller, and DRAM. Theoretically they could easily outfit the other side of the PCB for even more capacity although the MDX controller has to be able to support it. Although the Samsung 845DC EVO uses the newer Samsung MEX controller, the Samsung 845DC PRO instead uses the older Samsung MDX controller. We still don’t have any in depth information about the MDX or MEX controller other than the fact that the MEX controller is clocked at 400MHz and the MDX controller is clocked at 300MHz. As far as we know, both are tri-core ARM Cortex R4 based controllers with 8 channels apiece. While we’re still waiting on a response from Samsung as to why they decided to use the MDX controller, we believe the choice to go with the MDX controller on the Samsung 845DC PRO is likely due to the fact that most validation/testing was on the MDX/24-layer 3D V-NAND combination. While speaking with Samsung SSI earlier this year, we were told that there was already a variant of the Samsung SM843 (enterprise version of the Samsung 840 PRO) that was using 24-layer 3D V-NAND and had been in testing with some of Samsung’s closest partners. This leads us to believe that the Samsung 845DC PRO is likely to be a rebranding/final version of this mythical 3D V-NAND variant of the SM843. For NAND, Samsung is using their 24-layer 40nm 3D V-NAND – the predecessor to the latest 32-layer 40nm 3D V-NAND used in the Samsung 850 PRO. Unlike the new 32-layer part which uses 86Gbit dies, Samsung’s first generation 24-layer V-NAND part uses 128Gbit dies, which will give us even 128GB packages. 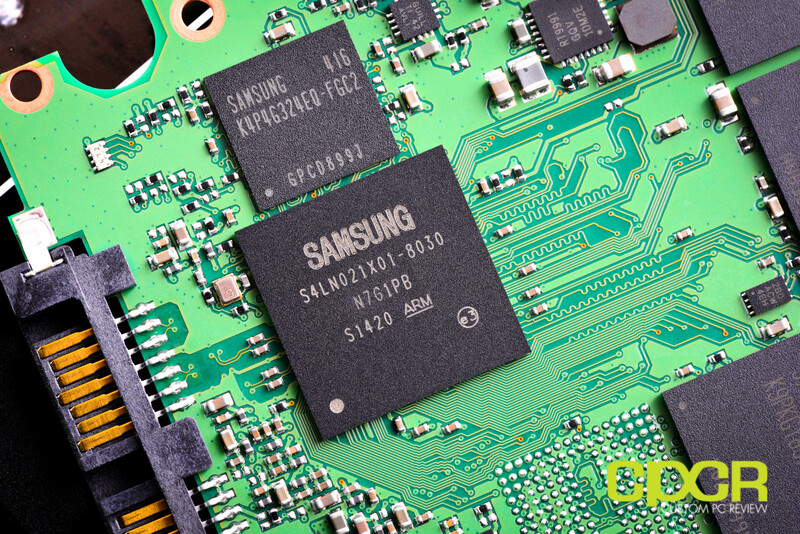 For more in-depth information about Samsung’s V-NAND technology, be sure to check out our review on the Samsung 850 PRO. Since we have the 400GB version, we get four 128GB NAND packages which yields us a total raw NAND capacity of 512GiB. This equates to ~28% overprovisioning. Although we don’t have the 800GB model, judging by the empty space on the PCB it likely has 8 NAND packages with 1,024GiB translating to ~28% overprovisioning as well. 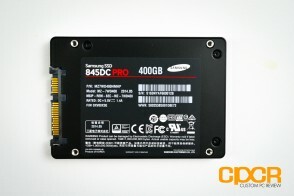 Onboard the Samsung 845DC PRO 400GB, we also get a 512MB Samsung LPDDR2 DRAM buffer. The larger 800GB capacity includes a 1GB DRAM buffer. 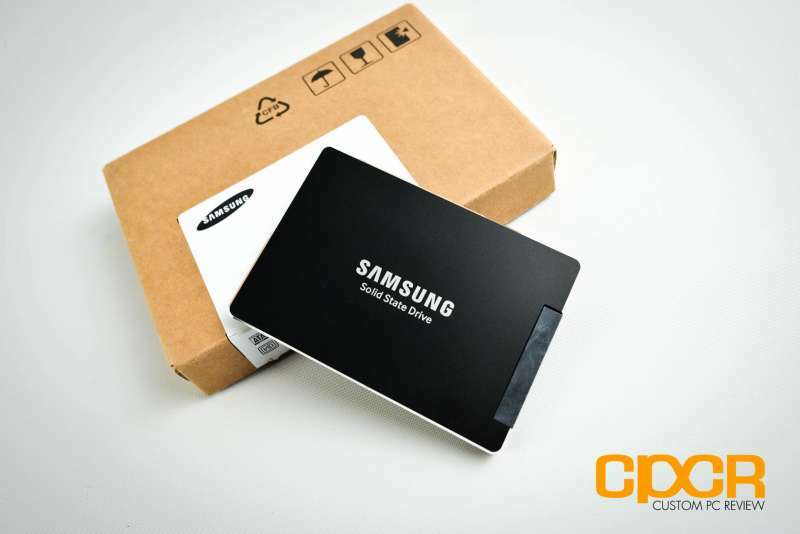 Since we’re dealing with an enterprise level drive, the Samsung 845DC PRO also includes an array tantalum capacitors designed for full data path power loss protection. 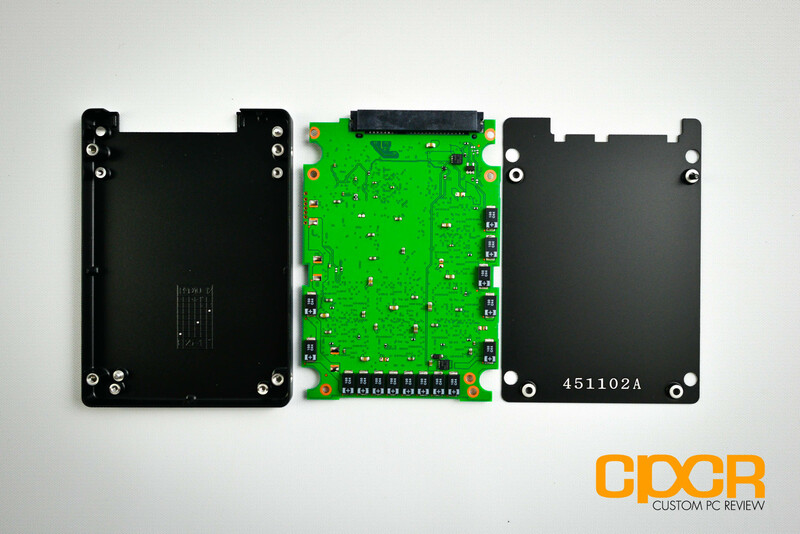 This ensures that all data in the volatile DRAM buffer as well as data in flight gets flushed into non-volatile NAND in the event of power loss. Today we’ll be reviewing the Samsung 845DC PRO with firmware DXV80X3Q. This is a pre-production sample with pre-production firmware, so final performance may be slightly different from the results we receive today. 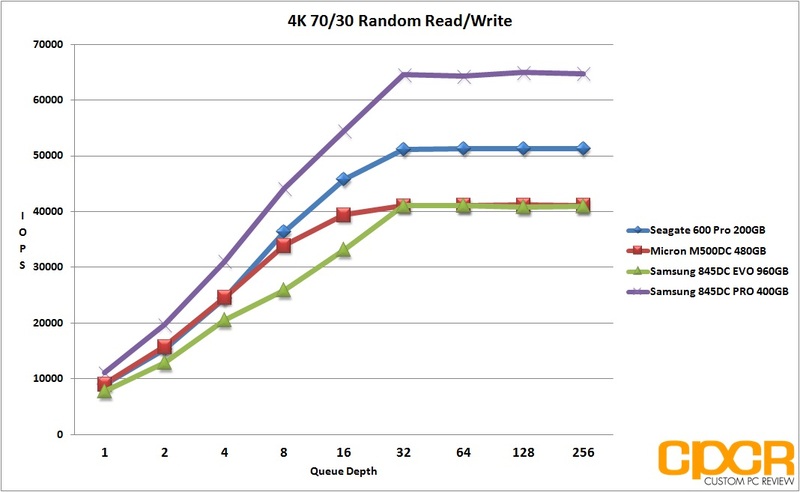 Before our 4K Random Read/Write performance testing, we’ll first precondition our enterprise SSD by secure erasing the drive then hammering it with a little over 30,000 seconds worth of 4K random writes at QD32. 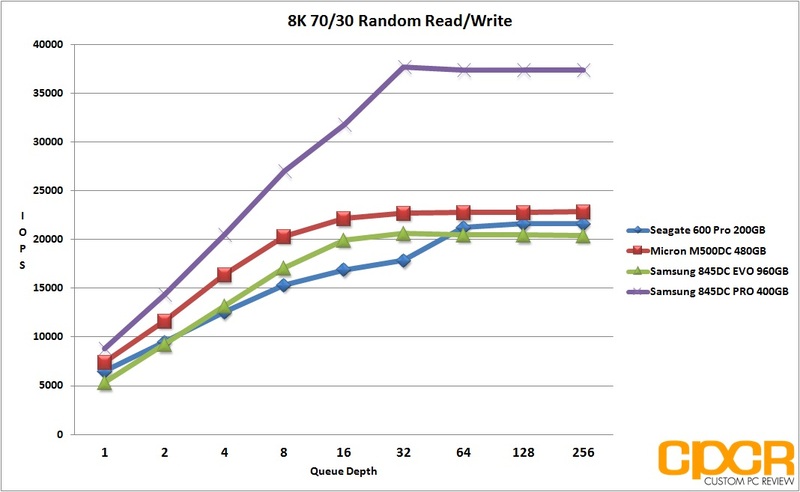 By recording the IOPS and latency every second during our run, it’s easy to see what kind of write performance can be expected as our SSD transitions from its fresh out of the box state into steady state. 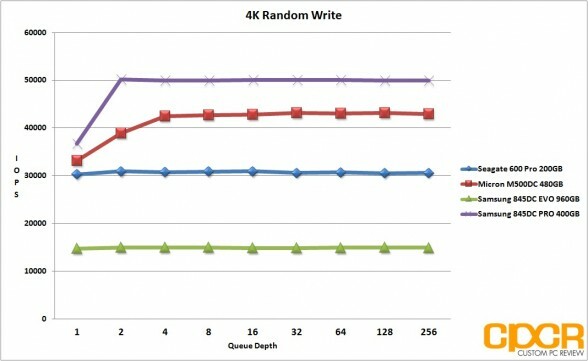 After our 4K random write preconditioning, we then run two more passes of 4K random data through the enterprise SSD for consistency before conducting our actual testing below. 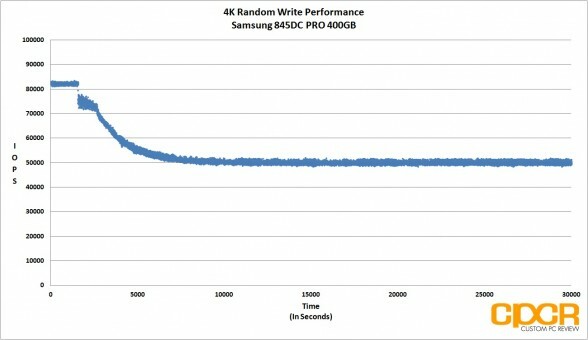 Looking at our 4K workload results, Samsung’s latest V-NAND is nothing short of amazing. 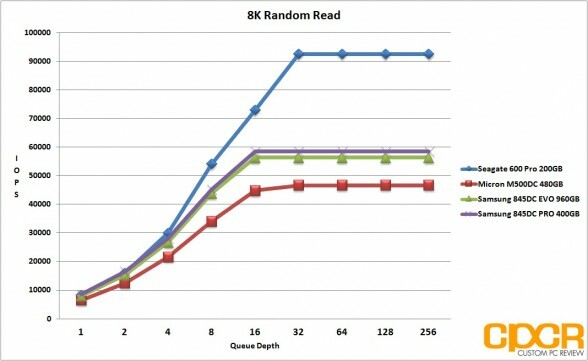 4K random reads reached ~100,000 IOPS at QD16 without issue while 4K random writes easily hit ~50,000 IOPS at QD2. 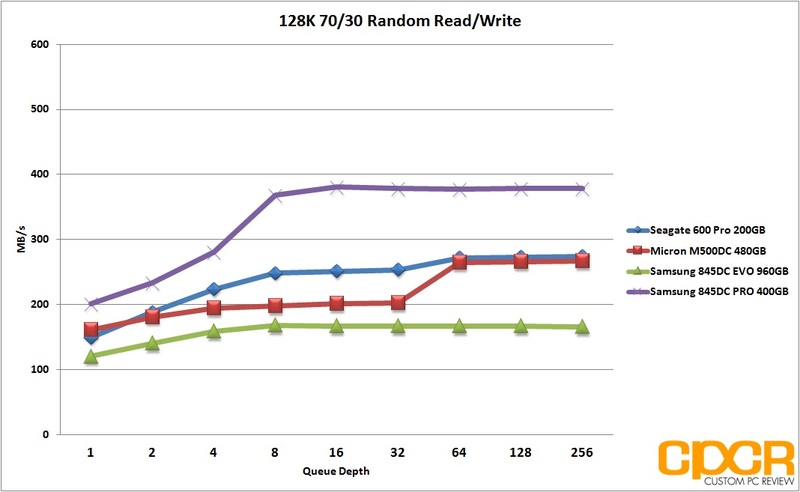 Mixed workload reached ~65,000 IOPS at QD32, which is one of the best results we’ve ever seen for a SATA SSD. Latency wasn’t an issue either as the Samsung 845DC PRO kept things well under 3ms throughout the entire length of our precondition run. 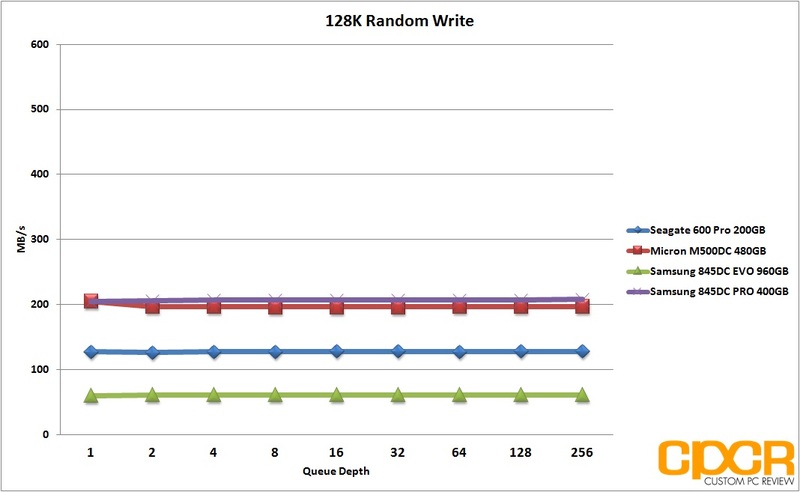 Samsung rates the maximum latency at 12ms 4K random writes at QD32, so we’re doing pretty well here. Before our 8K Random Read/Write performance testing, we’ll first precondition our enterprise SSD by secure erasing the drive then hammering it with a little over 30,000 seconds worth of 8K random writes at QD32. By recording the IOPS and latency every second during our run, it’s easy to see what kind of write performance can be expected as our enterprise SSD transitions from fresh out of the box into steady state. After our 8K random write preconditioning, we then run two more passes of 4K random data through the enterprise SSD for consistency before conducting our actual testing below. 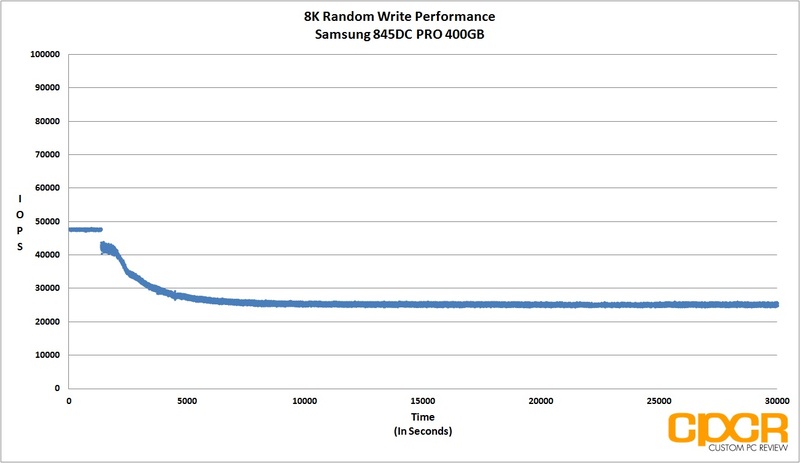 With 8K random workloads, the Samsung 845DC PRO once again posted some phenomenal results. 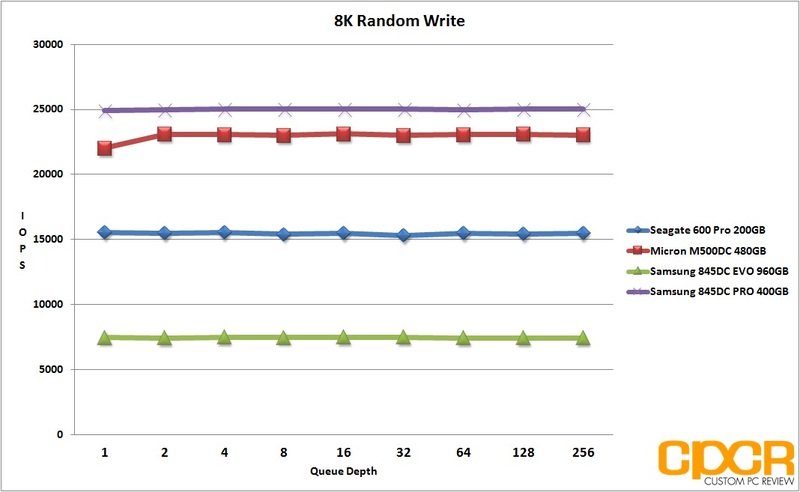 While the Samsung 845DC PRO was for some reason only capable of up to ~59,000 IOPS 8K random reads, random write performance was top notch coming in at ~25,000 IOPS. What’s most impressive however, is mixed workload performance as the drive pulled ~38,000 IOPS, the highest performance of any SATA drive we’ve tested here today. 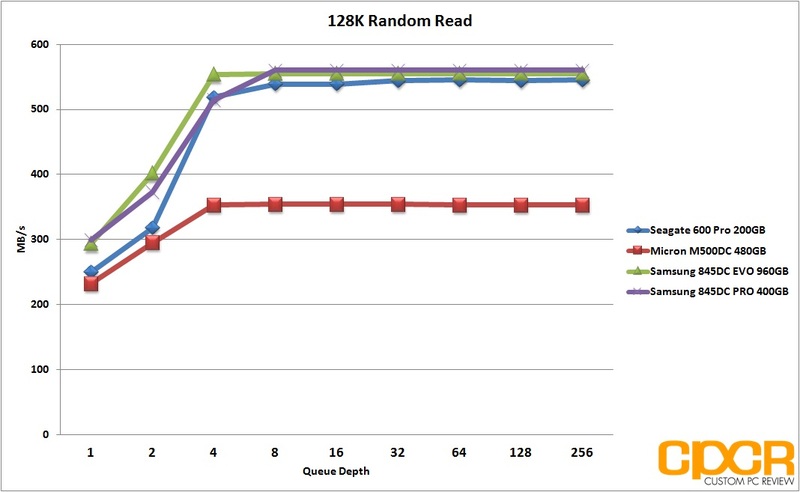 Before our 128K Random Read/Write performance testing, we’ll first precondition our enterprise SSD by secure erasing the drive then hammering it with a little over 30,000 seconds worth of 128K random writes at QD32. By recording the IOPS and latency every second during our run, it’s easy to see what kind of write performance can be expected as our enterprise SSD transitions from its fresh out of the box state into steady state. After our 128K random write preconditioning, we then run a two more passes of 4K random data through the enterprise SSD for consistency before conducting our actual testing below. With 128K workloads, the Samsung 845DC PRO once again was extremely quick. 128K random read performance came in at ~545 MB/s, which is around the limits of the SATA interface, but random write performance came in at ~208MB/s which slightly edges out the Micron M500DC despite its 62% overprovisioning. What’s most impressive here is again the mixed workload performance as the Samsung 845DC PRO was capable of up to ~381MB/s at QD16. While synthetic workloads are great indicators of a SSD’s performance, it’s not always indicative of how a SSD is actually going to be used in the real world. 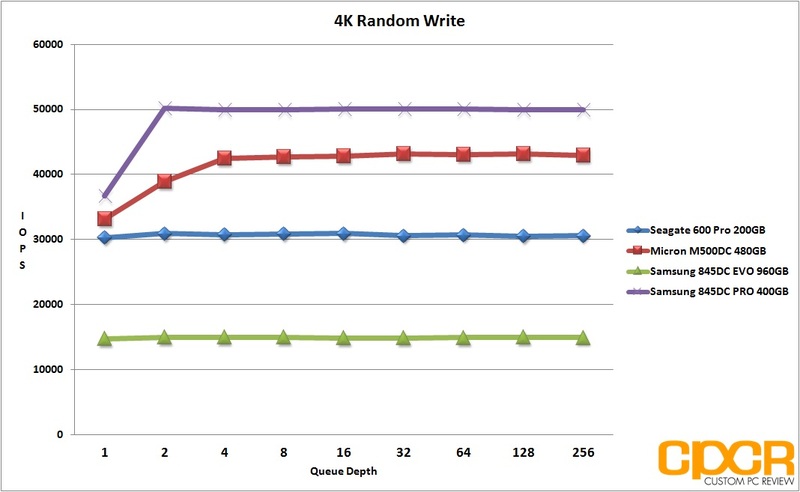 Very few applications for example will run continuous passes of 4K data at QD256. This is why we also run testing using typical access patterns users would face in the real world. Testing here is conducted after a secure erase is performed followed by two full passes of 128K data followed by two full passes of 4K random data. 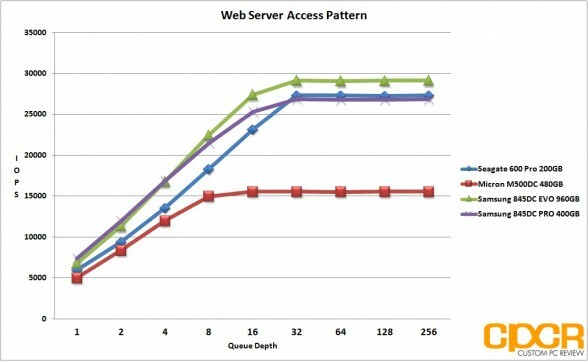 Our web server access pattern simulates the type of activity found in a typical web server. The access pattern is made up of 100% reads with blocksizes ranging from 512b up to a maximum of 512K. 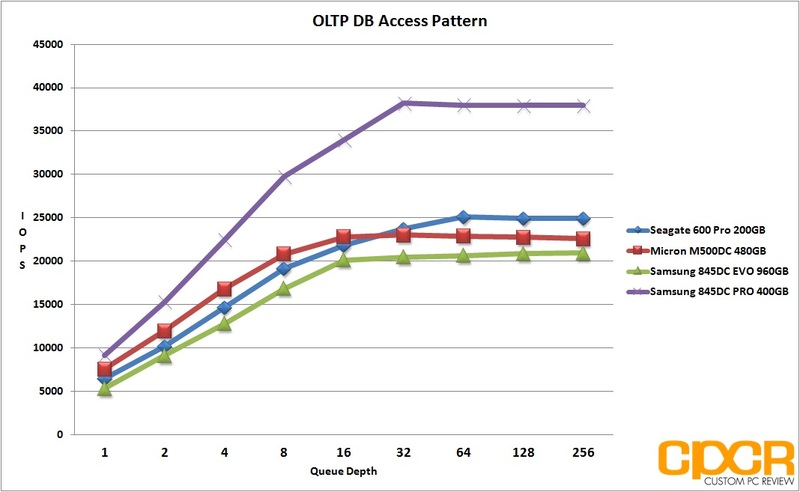 Our OLTP/Database access pattern simulates typical online transactional processing and database workloads. The access pattern here is made up to 67% reads and 33% writes at the 8K blocksize. Our file server access pattern simulates a typical fileserver. The access pattern here is made up of 80% reads and 20% writes with blocksizes ranging between 512b to 64K. With high read, write, and mixed workload performance, we weren’t surprised to see that the Samsung 845DC PRO excelled in all of our server profiles. 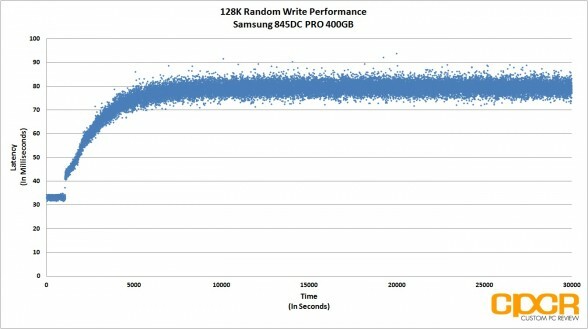 Although the Samsung 845DC EVO with its ultra fast read performance ever so slightly edged out the 845DC PRO in the 100% read web server access pattern, the 845DC PRO significantly beat every drive tested today in both the more write intensive database and file server profiles. 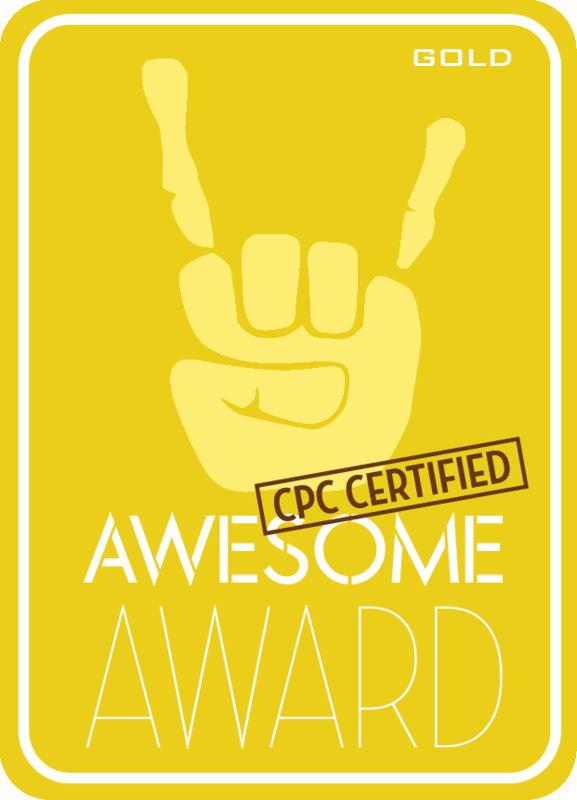 For our power consumption testing today, we’ll be conducting a trace on power draw during our 4K, 8K and 128K preconditioning runs. All power testing below is measured by tapping our calibrated B&K Precision 5491B Bench Multimeter directly into the 5v line running from the power supply to the drive. 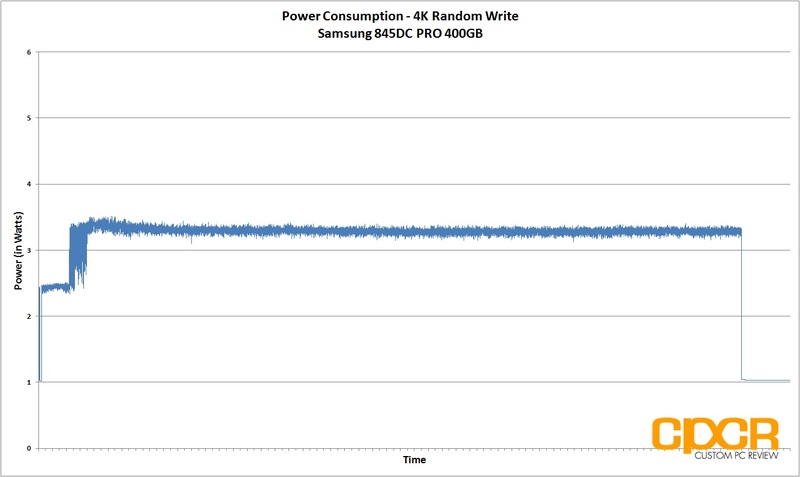 Idle power consumption on the Samsung 845DC PRO 400GB was ~1.1w while maximum load power consumption came in at ~3.6w during our 128K random write testing making it one of the most power efficient enterprise SSDs we’ve tested to date. When Samsung first discussed the possibility of 3D V-NAND a couple years back, its applications in the enterprise SSD space were immediately obvious. As the SSD industry as a whole has been moving to finer lithographies and 2-bit per cell MLC in the name of cost and capacity, we’ve seen significant decreases in both performance and endurance, which is a bad thing – especially for the enterprise. Fortunately Samsung’s 3D V-NAND avoids this problem, not only improving both performance and endurance, but Samsung is also promising higher capacity and lower cost as well, which should be interesting in the next 12-24 months. 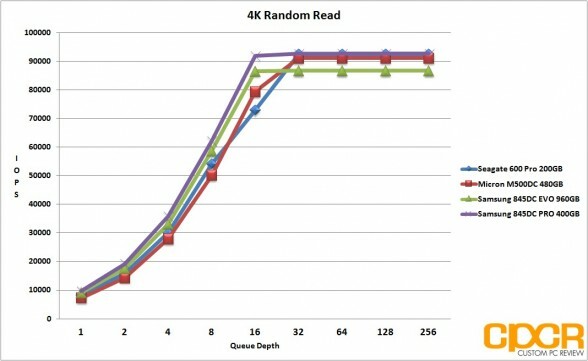 Given Samsung’s significant head start in 3D V-NAND, Samsung has the ability to retain this level of performance and endurance while continuing to stack to 48-layer, 96-layer, etc. As such, die capacities will continue to increase, reducing the cost of 3D V-NAND as a whole. The Samsung 845DC PRO is really just the tip of the iceberg and it’s absolutely incredible that we’re already seeing such impressive results. Performance on the Samsung 845DC PRO is nothing short of phenomenal. 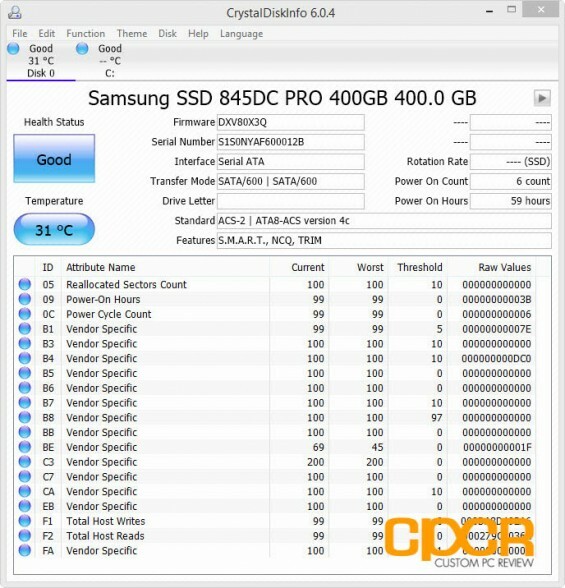 Thanks to Samsung’s new V-NAND technology, the Samsung 845DC PRO is one of the fastest SATA based enterprise SSDs we’ve tested to date. The drive performed very well in every type of workload we threw at it, especially excelling in mixed and random write workloads. 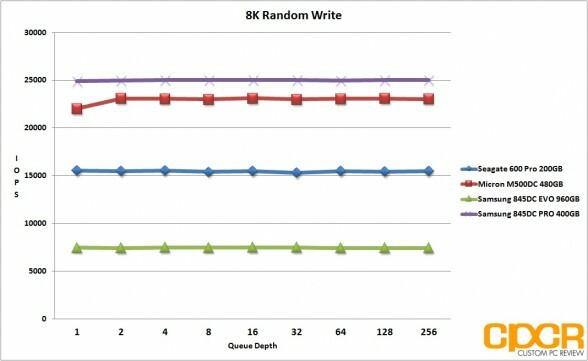 In our steady state 4K random write workload, the drive achieved a very impressive 50,000 IOPS with a sub-3ms latency without issue. 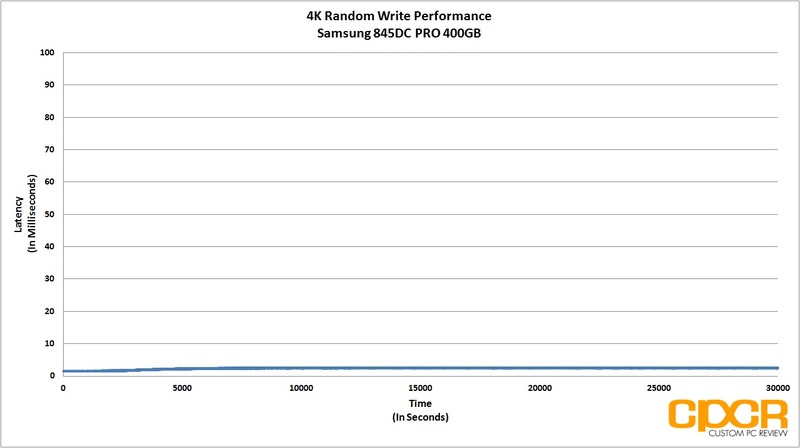 This type of performance is simply something you don’t normally see with the latest breed of MLC based enterprise SATA SSDs. 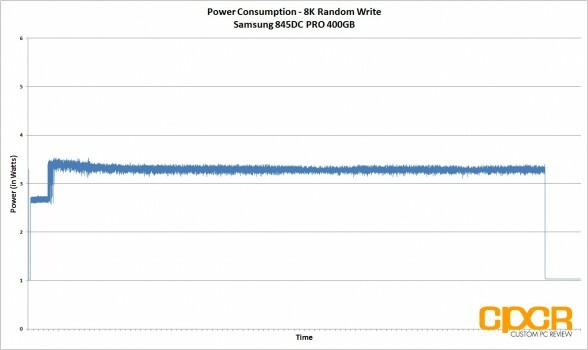 While we don’t necessarily discuss power consumption all that often for enterprise products, power consumption on the Samsung 845DC PRO was one of the best we’ve seen from an enterprise drive as well. While idle power consumption is only slightly lower than competing MLC offerings, load power consumption was on average ~2w lower than most enterprise MLC drives, including Samsung’s own 3-bit MLC based 845DC EVO. While this may not mean a lot for smaller server deployments, large server deployments with tens of thousands of SSDs each saving ~2w on average will see significant savings in both electricity and cooling costs, ultimately reducing TCO (Total Cost of Ownership). When I was at the Samsung SSD Global Summit a couple weeks back, I’m sure I wasn’t the only person who was giddy with excitement when the Samsung 845DC PRO was first announced. Then came the Q&A session where Samsung SVP of Brand Marketing, Unsoo Kim told us that the drive would be coming in at ~$1.50-$2.00, which really blew us away. At ~$1.50-2.00/GB for 50,000 IOPS 4K random writes, and 10DWPD at 5 years, the Samsung 845DC PRO would seriously undercut the rest of the industry, dealing a serious blow to competitors such as Intel, Micron and SanDisk. Unfortunately, we were recently told by Samsung that actual pricing on the Samsung 845DC PRO is expected to be $959.99 for the 400GB model and $1829.99 for the 800GB model, which puts it somewhere between $2.40-$2.29/GB – a more typical price found on drives of this caliber such as the Micron P400m and Intel DC S3700. That said, currently the only e-tailor that appears to have the drive listed is CDW, who’s currently listing the 400GB model for $1,058.99 and the 800GB model for $2,016.99, ~$2.65/GB and ~$2.52/GB respectively. With the Samsung 845DC PRO, Samsung has proven that their 3D V-NAND product is ready for prime-time and with the level of performance and endurance offered, it easily takes a top spot in the enterprise SATA SSD segment. 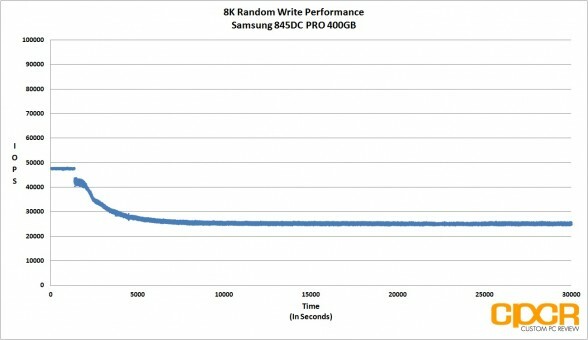 Given that we already know Samsung has been validating 3D V-NAND based products with their partners for at least a year (if not longer in-house), I’d highly recommend the Samsung 845DC PRO for anyone looking to deploy SSDs for write intensive applications.